This time last year, my sister bought her first house. It was dated but with good bones. With a limited budget, we have given it a good transformation and mainly just with paint. Pre reno. Love those slime green tiles, especially coupled with the feature poodle tiles! Post reno. Still the same lay out but now it has a new vanity and towel rails. The tiles have been painted with a special tile paint in a light grey. The walls painted a crisp white. New dark grey laminate has been laid on the floor. Overall a good result for very little spent. The vanity was new but bought off Gumtree for $150, stone bench-top a off-cut from the local stonemason for $100. Vanity from Bunnings warehouse for $180, the tap was the one they had previously in the kitchen. 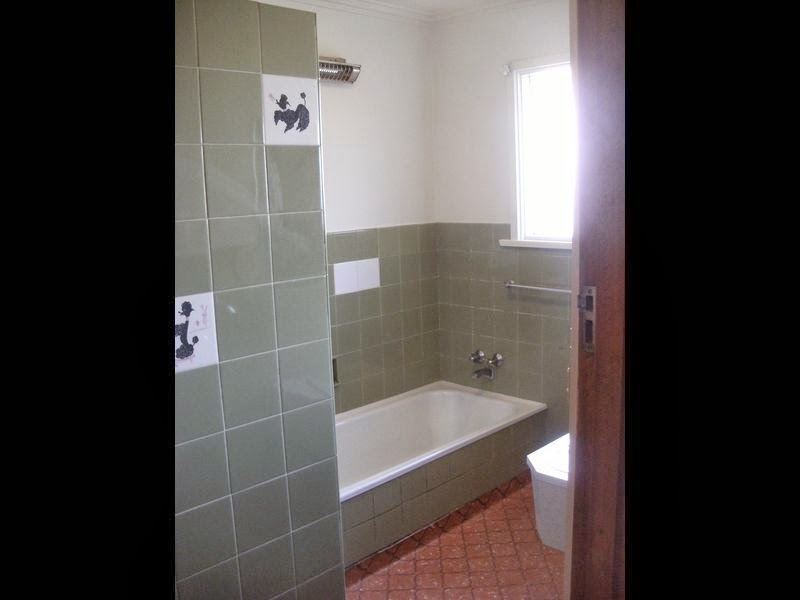 Flooring for approx $500 (including the toilet next door), paint $120 and towel rails approx $150. Next week I'll show you pictures of the renovated kitchen. Again, it's amazing what results you can get with not much money spent. Looking at your bathroom makeover, it only proves that we don’t have to shell out a lot of cash all the time to revamp any space, which in this case is the bathroom. It’s just a good combination of unlimited source of creativity and being resourceful with what we have at the moment. Lovella Cushman @ Perfection Plumbing and Drain Cleaning Ltd. This is awesome! I've been trying to do some bathroom renovation , and this gave me some great insight for things to try. Thanks for sharing!